Gephi is “an interactive visualization and exploration platform for all kinds of networks and complex systems, dynamic and hierarchical graphs”. Tony Hirst did a great blog post a while back showing how you could use Gephi together with DBpedia (a linked data version of Wikipedia) to map an influence network in the world of philosophy. 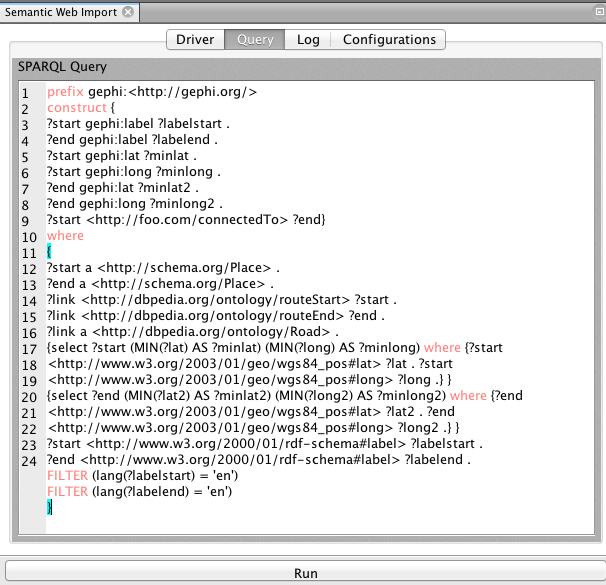 Gephi offers a semantic web plugin which allows you to work with the web of linked data. I recommend you read Tony’s blog to get started with using that plugin with Gephi. I was interested to experiment with this plugin, and to look at what sort of geospatial visualisations could be possible. Note that query for the lat and long is a bit more complicated that it might be. 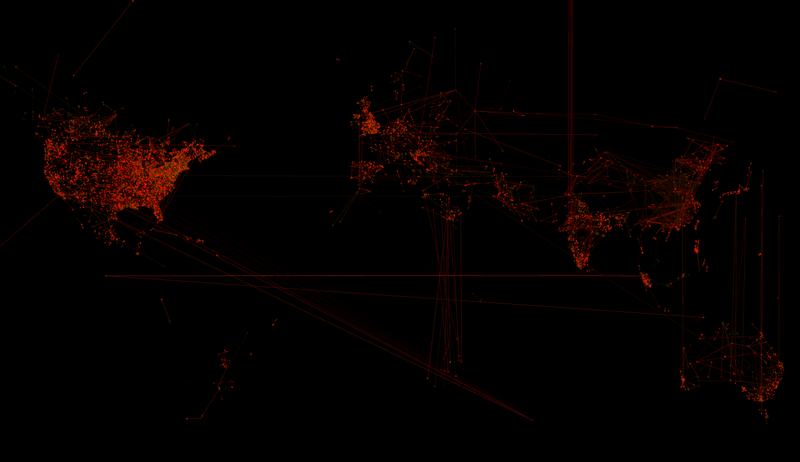 This is because DBpedia data is quite messy, and many entities will have more than one lat/long pair. I used a subquery in SPARQL to pull out the minimum lat/long for all the pairs retrieved. Additionally I also retrieved the English labels for each of the start/end points. Now hit the run button and watch the data load. To visual the data we need to do a bit more work. In Gephi click on the ‘Data Laboratory’ and you should now see your data table. 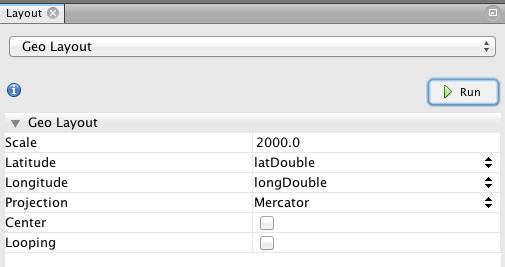 Unfortunately all of the lats and longs have been imported as strings and we need to recast them as decimals. To do this click on the ‘More actions’ pull down menu and look for ‘Recast column’ and click it. 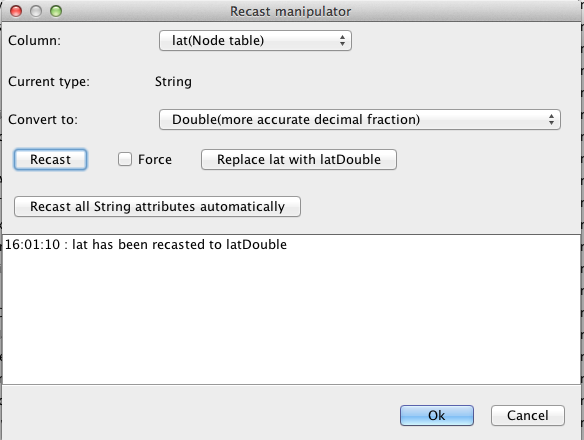 In the ‘Recast manipulator’ window go to ‘column’ and select ‘lat(Node Table)’ from the pull down menu. Under ‘Convert to’ select ‘Double’ and click recast. Do the same for ‘long’. in your display panel (click image to view in higher resolution). Given that this is supposed to be a road network you will find some oddities. This it seems to down to ‘European routes’ like European route E15 that link from Scotland down to Spain.